A simple recipe made easier thanks to salted caramel flavoured icing sugar! I would normally have to make salted caramel from scratch (lactose free) so using a 250g from The Shire Bakery made a delicious frosting with time to spare! The flavoured icing sugar smells incredible, just like melting marshmallows by a fire and has the richness of caramel too. 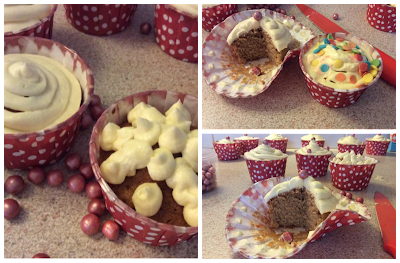 The toffee flavours work perfectly with the gingerbread sponge cupcakes; just like a festive sticky toffee pudding. 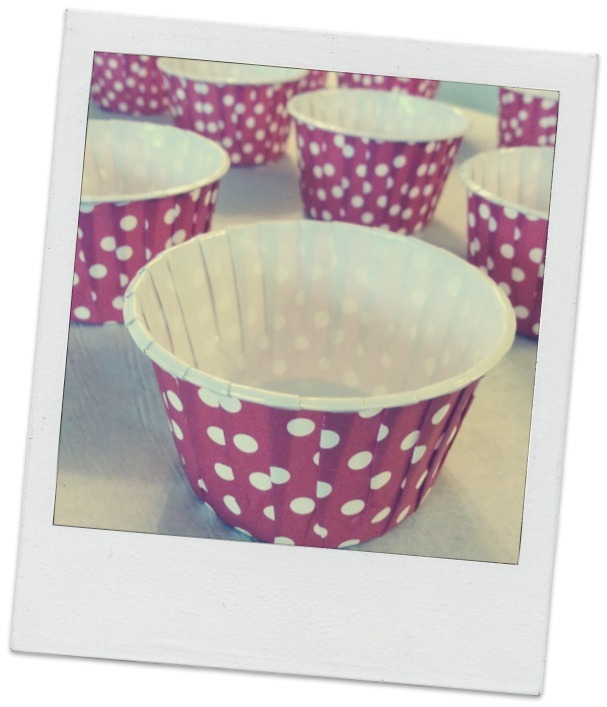 Rather than using my muffin pan which has seen better days (and I am wondering why the bottoms of cupcakes always seem a tad greasy), I used 12 red polka dot free-standing baking cases from The Shire Bakery, which has an amazing choice of these style of cases. I think these really helped with the lightness of the sponge plus the non-stick cases concertina out to make a little plate which is more robust than a thin paper case. 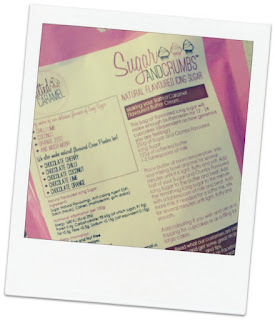 1 250g bag of Sugar and Crumbs flavoured icing sugar. Available from The Shire Bakery in a variety of delicious flavours. 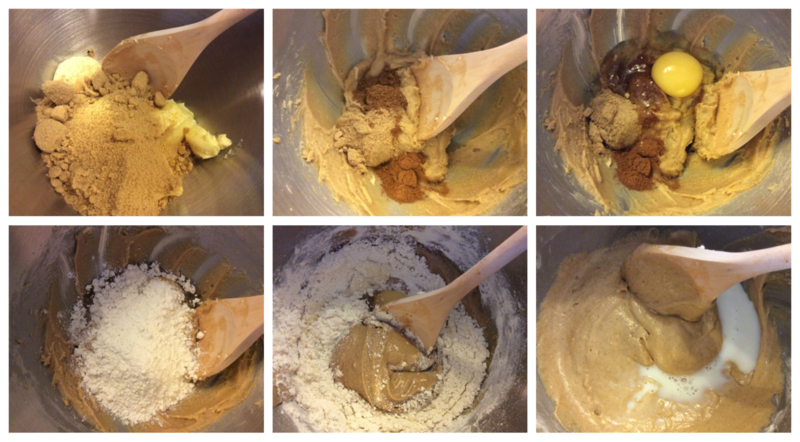 Cream the soft brown sugar and baking block together using a wooden spoon or a standmixer until light and creamy. Add the spices and one of the eggs and lightly combine. Add a third of the flour, mix and then add the second egg and combine. Repeat until the flour and egg have been incorporated. Finally add 1 tbsp of milk (I used Lactofree semi-skimmed) and briefly mix. Load up each baking case with 2 generous tablespoons of mixture. I used a regular sized ice cream scoop. Bake for 15-20 minutes at 180 degreesC or 160 degreesC Fan until the cupcakes have risen and are a light brown colour. My cupcakes domed but also looked slightly volcanic! Allow the cupcakes to cool and prepare the frosting. Each Sugar and Crumbs flavoured icing sugar bags have instructions on how to prepare the icing depending on the weight of the bag. 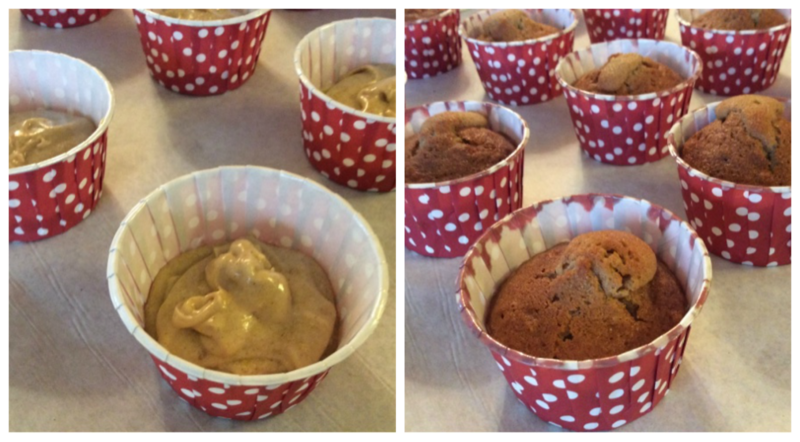 I used a 250g bag which called for 125g butter or baking block which I softened before beating in half the contents of the bag. I probably inhaled a bit of icing sugar at this point! I added 1 tbsp of milk before beating in the remainder of the bag to acheive the desired consistency. I decided to put the bowl in the fridge to allow the frosting to firm up. 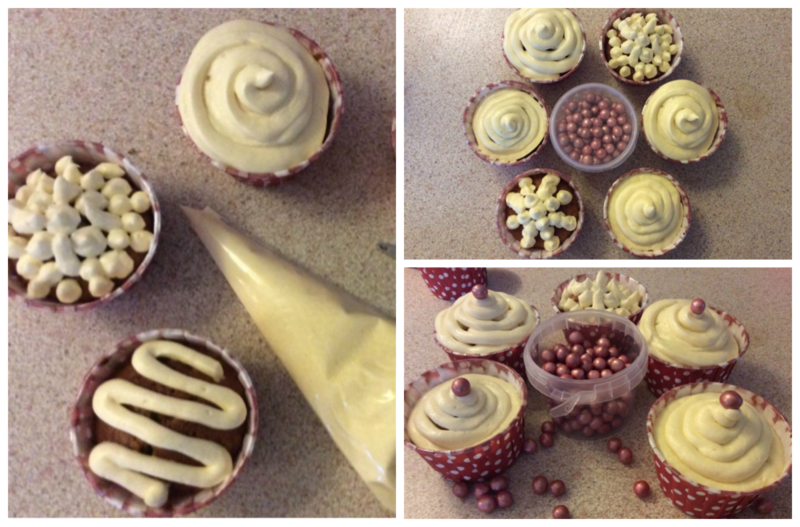 Once the cupcakes were cool I loaded up a disposable icing bag full of salted caramel frosting and just got creative with piping and I used giant 8mm red pearl decorations (also available from The Shire Bakery) which are made from natural ingredients and have a slightly nutty taste. 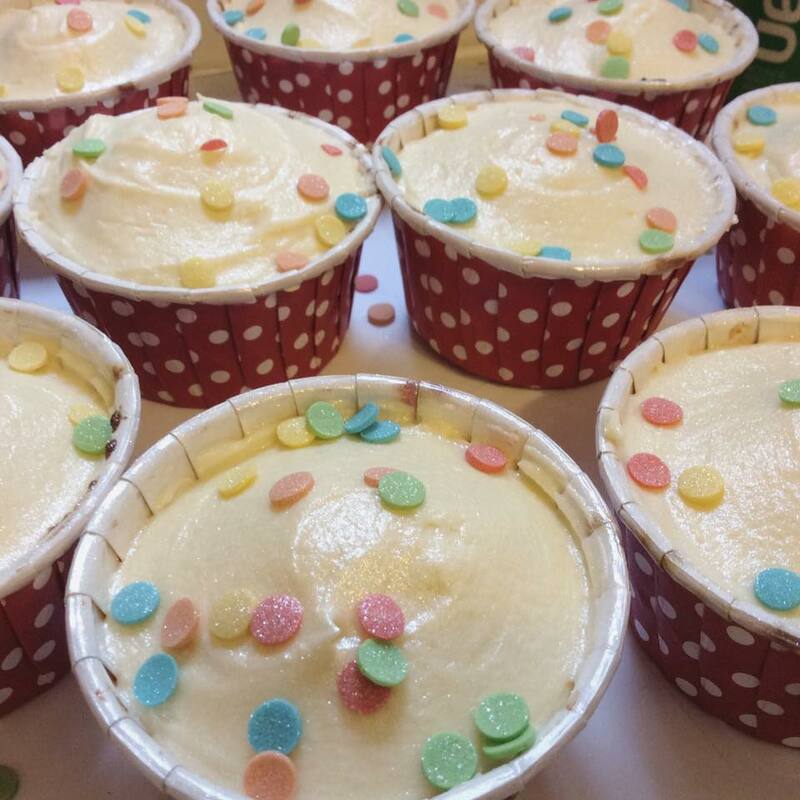 Lily decorated her own cupcake with lots of colourful sprinkles, and many were eaten! I made a batch of these for our New Year's Eve party with family and I used Dove's gluten free self-raising flour as I have another member of the family who is really wheat-intolerant, and I just reduced the flour by a few pinches. By doing this I don't notice a floury taste. They were moist and flavourful baked this way too. I added some more of the rainbow polka dots (so if Mister Tumble was to pop over I'm sure he would be impressed!) and sprayed on some edible silver glitter.